A while back, reviewing the SEGA 3D Classics Collection, I had read of a secret game in the collection that had to be unlocked. The only knowledge I had was that it most likely was the SMS version of Fantasy Zone, and behold, I was right. Though I was under the assumption that it had to be unlocked the same way it was in the Fukkoku Archives 2. (I’ll admit. I done derped.) Originally having to be unlocked by having data from the first 3D Archives collection in Japan, they simplified it for the American release of Volume 2. Late last night, I decided to do some exploring through the menus of 3D Classics Collection, and see what I could find. 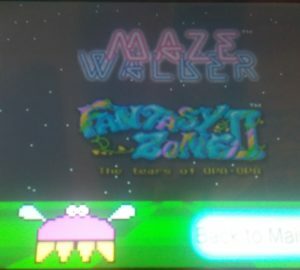 No other major secrets are hidden in here, but one big one is hidden in the “Extras” menu where you find Maze Walker and the original SMS Fantasy Zone II. By tapping the area right next to the “Back to Menu” button, a little enemy from Fantasy Zone 1 pops up. 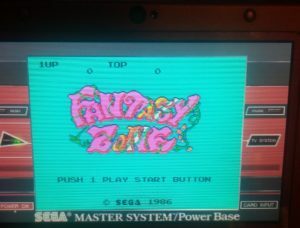 Tap on that, and you will be taken to the original SEGA Master System version of Fantasy Zone, included as a secret game in the collection. The same features as the other SMS games on the collection are here as well, like “Helper-mode” and the FM/PSG sound switch. Now that you have booted Fantasy Zone once, the game is permanently unlocked through the Game Select menu, as well as the Extras menu you originally used to unlock it in the first place. So instead of having to have the data from the first Japanese collection, you just have to tap on the menu, I can dig it. Pretty cool stuff, huh?